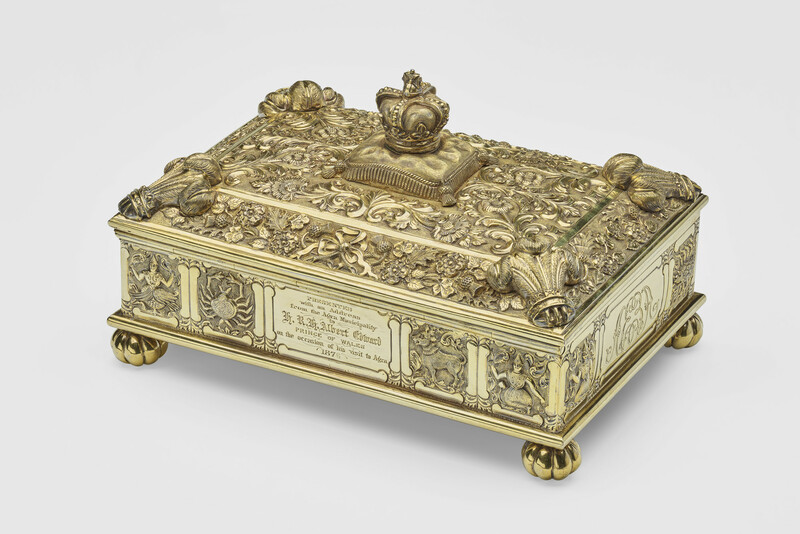 A silver gilt address casket made in Edinburgh by goldsmiths Marshall and Sons. The sides chased with panels of Hindu-inspired deities, zodiac symbols in square reserves, the Royal Coat of Arms and an 'AE' monograph for Albert Edward. The border of the hinged lid chased and worked in high repousse with roses, shamrocks and thistles in high relief and the Prince of Wales's feathers. The centre of the lid surmounted by crown on a cushion, a decorative motif often used on freedom caskets made by the company.